Tomorrow marks 100 days since Britain voted to leave the European Union. There's no doubt June the 23rd's decision was one of the biggest political shake-ups in history. In the South, almost 53 percent of people, more than 1 point 3 million, voted to leave. Gosport had the strongest 'leave' vote with 64 percent of people wanting OUT of the EU. Only 7 areas in the South voted to remain, including Hart, Brighton and Hove and Winchester. So how does the South feel about the EU result 100 days on? Here's Juliette Fletcher. People in the South are being urged to record their sightings of bees after scientists at the University of Reading warned it would cost more than £1.8 billion every year to pollunate crops by hand if the insect died out. More than 20 UK bee species are already extinct and about a quarter of the remaining 267 species are at risk. The results from the Great British Bee Count will be published in the Autumn. The Great British Bee Count is a fantastic excuse to get outside and see bees in action - they're fascinating, beautiful and do a vital job. The data that people collect will do an important job to help scientists fill in the blanks about where bees are thriving - and where they're in trouble." We hope that thousands of people download the app this summer - the great thing is that you don't need to be an expert, everyone can get involved and be part of the generation that helps save our bees. We want this to become an annual event as it's a great way for people to learn more about this iconic species and work out the best ways to help them." The average price of a house is now higher than ever before according to a new survey. The building society Nationwide says the average cost of a home in the UK is now more than £186,000 which is 11% higher than this time last year. In the South, the average price is more than £217,000 pounds. We spoke to Robert Gardner, Chief Economist from Nationwide. Nationwide report showing property prices have risen by 11.1% over the last year also marks the second month in a row where annual growth in property values has hit double digits, following a 10.9% year-on-year uplift in April. But on a monthly basis, prices rose by 0.7% in May, which represents a slowdown compared with the 1.2% monthly increase seen in April. Property values have now been edging up for 13 months in a row on a month-on-month basis. 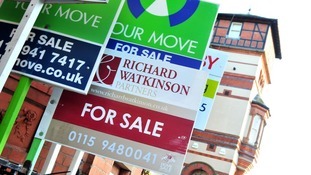 Across the UK, average house prices now stand at £186,512. Robert Gardner, Nationwide's chief economist, said it is "too early" to say whether the housing market is seeing the start of a cooling trend. Mr Gardner said some signs of a slowdown may partly be due to toughened mortgage lending rules introduced in April, "which may take a few months to bed down". House prices leapt by 11.1% over the 12 months to May to reach £186,512 on average across the UK, marking the fastest annual growth seen since June 2007, Nationwide Building Society has reported. Chris Pax, Expert Forager, gives his tips on staying safe when foraging for your food - what to look for and what to avoid. What do you say about food that happens to be free!? Well, food foraging is become even more popular among walkers - and even famous chefs. So we sent Hannah Stokes to a cookery school, to discover the secrets of the English landscape - and, it's not without its dangers, too. Every generation has its rebellious trend. But few youth cults have achieved the notoriety of the Mods and Rockers. 50 years ago this weekend, rival gangs clashed on beaches along the South Coast, most famously at Brighton. But why did they clash so much? And what's happened to them since? Malcolm Shaw has been to meet the Mods and Rockers. The last stores at troubled furniture chain Paul Simon are to close in the South over the next month. Administrators say stores in Aylesbury, Aylesford, Fareham, Farnborough, Southampton and Swindon are among the final 22 shutting down, once stock has been sold in clearance sales.